In the late 19th century the Russian czar encouraged the settling of virgin lands. At that time Latvia was on the border of the Russian empire, and from 1894-1914 Latvians established approximately 200 settlements in Siberia. At the time, more than 200,000 Latvians lived scattered throughout Russian territories east of present-day Latvia. Most of the settlers were landless peasants, tenants, servants or craftsmen. This was the only opportunity for them to finally own their own land and work it as they wished, instead of continuing to serve the German landowners in Latvia. The 1920s and 1930s were a particularly successful time for the Latvian settlements in Russia. Many Latvians owned workshops or large, well-tended farms with modern agricultural technology. Some even owned dairies. During the 1933-1934 academic year there were 119 Latvian schools in Russia, 17 of which were secondary schools. Until 1935 there were also several publishing houses, publishing newspapers and books exclusively in the Latvian language. The Latvian settlement named Augšbebri was founded in 1897. Emigrants from Latvia toiled to clear fields and tend crops in the area beyond the Irtysh River. They built houses and lived on individual farms, as they had done in Latvia. Finally they were free to tend their own lands, grow their own crops and cattle, and build their own houses. The villagers still refer to those as the good old times. Josef Stalin began the forced collectivization of Russian lands in 1927. As a result, many Latvian owners of successful individual farms were driven onto kolkhozes (collective farms), and all they owned was deemed common property. Latvian schools, clubs and libraries were closed. The people were forced to speak and write in Russian—a language that the Latvians had not always needed to learn before then. Many Latvian settlements were liquidated or flooded with other ethnic groups. Today Augšbebri—called Babrauka by the locals—consists of one long street with approximately 60 houses. Of the 200 or so inhabitants, 116 (according to a 1997 poll) consider themselves Latvian. These are descendants of the Kupsis, Vērnieks, Kalniņš, Barons, Otaņķis, Pumpurs, Leja, Līksnis, Varpa, Ņezduļķis, Smilga and Auzis families. The rest of the inhabitants are of German and Estonian heritage, as well as a few Russian families. In 1989, as the atmoda (National Awakening) was beginning in Latvia, several enthusiasts, supported by the Latvian Foundation and the Latvian Ministry of Education, established the Latvian Education Mission, the goal of which was to select and send teachers from Latvia to the Latvian settlements in Russia. After a period of 50 years, the teaching of the Latvian language in Russia had finally been resumed. For three years—until the summer of 1992—teachers from Latvia taught in Arhlatviešu village in the Bashkir Republic (Bashkiria), in Rižkova and Augšbebri in western Siberia, and in Lejas Bulāna in eastern Siberia. Dace Dombrovska was the teacher of Latvian language and traditions in Augšbebri during this time. After an interruption of several years, the Latvian Education Mission in Russia was resumed again in 1998, this time financed by the World Federation of Free Latvians and the Latvian Evangelical Lutheran Church Outside of Latvia, as well as the Latvian embassy in Russia. Teachers were again sent to Arhlatviešu village in the Bashkiria, Augšbebri in Omsk District and Lejas Bulāna in Krasnoyarsk Territory to teach the Latvian language. After more than a century of their parents’ and grandparents’ emigration, the older Latvian generations in Russia still speak in a beautiful Latvian tongue with a slightly old-fashioned sound to it, especially heard in grammatical forms such as irād (is) and navād (is not). Surprisingly, these people, who have been born and have lived their entire lives in Siberia, speak Russian with a noticeable accent. The people of Augšbebri use words borrowed from Russian when they speak Latvian, such as napitoks (a drink), boļņica (a hospital) and boļšaks (a highway). Many of these were new objects or ideas that did not exist at the time when the first Latvians settled in Siberia, and therefore new terminology had to be developed. The easiest route was to take the appropriate word from Russian and adapt it to Latvian pronunciation. Unfortunately, the passing of the Latvian language from one generation to the next has now come to an end. At best, children and young people today only understand Latvian, but do not speak it. There are only a few families in the village in which the parents speak Latvian with their children. Therefore, the children now study Latvian as a foreign language. Since 1998 the students in grades 1-4 at the Augšbebri school—a total of about 10 children—study Latvian as an elective subject. The parents’ attitude is generally positive, and as a result almost all of the children attend Latvian lessons. Older children and teenagers (who go to school at the secondary school in Martyushevo, 12 kilometers from Augšbebri) study Latvian in the afternoons at the village clubhouse. Adults attend lessons in the evenings. In addition to language lessons, the teachers from Latvia have also directed drama clubs and offered lessons in the English language and psychology. Thanks to various publishing houses in Latvia and other supporters and patrons, Augšbebri currently has a fairly extensive collection of learning materials and video films in Latvian, as well as a small library. The Augšbebri Latvian Club has also obtained a television, VCR, stereo, photocopier and computer with help from the Latvian State Culture Capital Foundation. In the autumn of 1999 the Augšbebri Latvian Club was the best-equipped clubhouse in all of Omsk District. A peculiar phenomenon of Augšbebri is that since the beginning, many members of other ethnic groups who have married into or otherwise emigrated to the village have learned the Latvian language. Today two identities coexist in Augšbebri: the Latvian identity, and the Russian, or Siberian, identity. The majority of the inhabitants of Augšbebri consider themselves to be Latvian and even act insulted if someone tries to call them Russian. But at the same time their way of life is distinctly Siberian. Tall fences and gates divide their houses and outbuildings from the street. In the courtyards behind the fences, boardwalks save their shoes from the mud. The gardens stretch behind the yard and outbuildings. Most of the buildings are made of logs from the surrounding taiga. Moss is stuffed into the spaces between the logs. Houses are heated with firewood, which is also hauled in from the taiga. It seems that the taiga provides for all of the villagers’ needs: there they pick berries and mushrooms, hunt birds, gather branches from which to dry meat, and fish in its rivers. Especially in recent years, while Russia is experiencing great economic problems, timber and other wood materials from the forest are also an important source of income. There are only a few state-run jobs in the village: one saleswoman, a couple of workers in the clubhouse and school, a mailwoman and a doctor’s assistant. But even the “lucky” ones, who receive a supposedly regular salary (many are not paid on time), are not able to cover all of their expenses. For example, in 1999 a bus ticket to Omsk and back cost USD 6, but a teacher’s monthly salary was only USD 30. 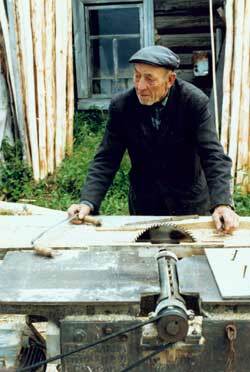 The kolkhoz still exists, and many of the villagers work there. Wages, though, have not been paid for years. Sometimes workers do get paid, but in noodles or rubber boots, instead of money. The only way people earn real money is by working in the forests. Retirees are considered the most secure, because they at least receive a regular pension. The difficult economic situation in the village causes many social problems. Adequate health care is not available, if at all. Even basic medications, vitamins and vaccinations are lacking. Only very few families are able to provide a post-secondary education for their children in Omsk or some other large city. The limited opportunities to live a meaningful life have driven many to alcoholism. Life in Augšbebri is not easy. Russia’s economic and social troubles directly affect everybody, including villagers. For example, since there is no money for road repairs, the roads leading to Augšbebri are practically impassable during spring and autumn, and there is no bridge across the Irtysh River, providing direct access to the city of Tara. As a result, Augšbebri is isolated from the rest of the world for at least half of the year. Hardly anyone in Augšbebri owns an automobile – there are only about 10 in the whole village. A popular mode of transportation to reach the nearby villages of Martyushevo (a distance of 10 km), Kurzemes Ozolciems (12 km) and Yegorovka (20 km), as well as Tara (40 km), is the motorcycle. Horse-pulled sleighs are used in the winter. Teams of horses and wagons wait outside the clubhouse on election day. The only form of public transportation connecting Augšbebri to the outside world is the bus, which is scheduled to make a stop on the highway going towards Tara in the mornings, and another stop on the way back in the evenings. But in reality, the bus only runs about three to four months a year due to poor road conditions—in autumn the road becomes in impassable mass of mud, and in winter it is covered with a thick layer of snow. Waiting at the bus stop, one never knows whether the bus will come today or not. The Irtysh River separates Augšbebri from the nearest village, but it cannot be crossed for approximately three months of the year, while the ice melts in the spring and forms in the autumn. During these times the villagers have no access to a doctor, because there is no doctor on their side of the river. Although a first aid post in the village stocks vaccinations, the only real urgent care is in Tara. Several villagers have been born in an automobile or on the ferry en route to Tara. A couple of villages lie even beyond Augšbebri, but beyond them the great taiga stretches to the Arctic Ocean. Despite the harsh environment, difficult work and Russia’s economic problems, the inhabitants of Augšbebri have not lost the sparkle in their eyes, the joy in their hearts or their knowledge of songs and dances. One encounters humor, songs, dances and games at every turn. At the onset of winter, when fields of snow reach as far as the eye can see and the thermometer sinks to minus 30-40 degrees Celsius, the villagers are finally able to relax. The short summer was filled with constant, hard work in order to provide firewood, hay, berries, mushrooms and vegetables. Finally in winter the villagers can sit peacefully and nibble pine nuts, watch television, spin wool and knit socks. Winter is also the time to rest and celebrate. Augšbebri celebrates all of the holidays: Christmas and the New Year, as well as those same holidays a second time according to the old Russian calendar; the Soviet holidays of Army Day, Womens’ Day and Victory Day on May 9; Easter and Jāņi (the summer solstice). Recently the villagers have also begun to observe Nov. 18 (Latvian Independence Day), and they even hold a Valentine’s Day dance. All holidays are celebrated in the clubhouse, which is also where the folklore group Varavīksne holds its weekly rehearsals. The group sings traditional Latvian folk songs and dances old-time dances, many of which have long been forgotten in Latvia. But the group also learns songs in Russian for regional choir competitions and other performances in Tara. No one in Augšbebri can read music or play a musical instrument, except for “Varavīksne” member Valentīna Šilova, who learned to play the bayan (a type of button accordion) by ear. Relatives and friends remember each others’ birthdays and celebrate by setting the table with delicacies from the forest and their gardens: bird cherry compote, various jams and jellies, sauerkraut, marinated mushrooms, potatoes, fish, and many pork and beef dishes. Moonshine also helps the merriment. Made from sugar or bread, the home-made drink is usually around 70 percent alcohol, and is diluted to 40-50 percent before being served. Despite having endured more than 70 years of atheism, there are still people in Augšbebri who listen to, speak to and believe in God. Augšbebri has no minister and no church, so women of the older generation take turns hosting prayer meetings every Sunday. Until recently these services still took place in Latvian, but Russian has become their main language since several younger people have joined the group of believers. The songs, though, are still sung in Latvian. Lately the villagers have established contact with Baptist congregations in Tara and elsewhere in Omsk District. The local minister or Baptist missionaries from the United States now visit the village a few times a year. A group from Latvia (photojournalist Uldis Briedis and documentary film maker and historian Ingvars Leitis) first visited the Latvian colonies in Siberia in 1975. They also visited Augšbebri and Kurzemes Ozolciems (12 kilometers from Augšbebri) in order to meet with the descendants of the 19th century emigrants and to tell about them back in Latvia. Inga Utena (the director of the Latvian TV program “Spiets”) and Māris Jurgensons (cameraman of the TV program “Labvakar”) visited Augšbebri in 1990. The following spring members of the Kalniņš family from Siberia took part in a “Spiets” program about families of singers. 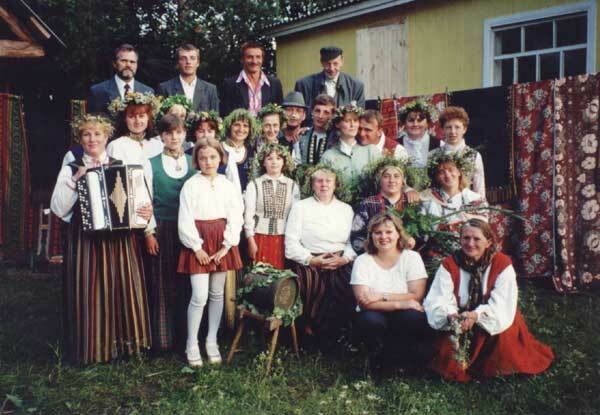 The Augšbebri folklore group, led by Olga and Pēteris Vakenguts, traveled to Latvia for the first time in 1991 to take part in the Baltica festival in Latvia. The theme of their performance was wedding traditions, and they surprised many Rigans with their knowledge of the Latvian language and ancient melodies. Roberts Ķīlis, a doctoral candidate in social anthropology at Cambridge University, lived in Augšbebri from November 1996 to September 1997 to gather data for his dissertation. While observing the everyday life and learning the history of the village, he discovered many facts that even the villagers themselves had not known, for example, that 1997 marked the 100-year anniversary of the settlement at Augšbebri. Thanks to Ķīlis’ initiative, a wide-ranging anniversary celebration was organized. More active contact between Augšbebri and Latvia has taken place recently. 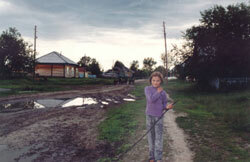 A group from Juris Podnieks’ film studio visited the village in July 1997. Imants Daudišs (the Latvian ambassador to Russia) and Lauma Vlasova (the Republic of Latvia’s attaché on diaspora issues in Russia) visited in February 1999. “Baltie berzi”, a men’s choir from Valmiera visited Augšbebri in the summer of 2000. Many villagers also traveled to Latvia. Varavīksne went to Latvia again and participated in the 1998 and 2001 song festivals. In recent years, a family from Augšbebri is invited to participate in a 3×3 family camp in Latvia every summer. The Latvian Ministry of Culture financed a filming expedition to the former Augšbebri, now Bobrovka, in the summer of 1997. The premier of the resulting film, “One Village in Siberia,” took place at the clubhouse in Augšbebri in late 2000. The film shows all aspects of life in the village—everyday work, households, free time, joys and sorrows—and also shows the villagers expressing themselves about the past, present and future. A feeling of respect, awe and love towards their hardy countrymen, who have been separated from their ethnic homeland for so long, emanates from the filmmakers throughout the film. In 2001 “One Village in Siberia” producer Vaira Strautniece received the “Lielais Kristaps” Latvian National Film Festival jury award for extensive research into the fate of the nation. Fascinating article. Thanks, to all who gathered this information and made it available. I am searching for my Latvian grandfather JANIS GRASIS. b1875 d 1950. He was supposed to be a high ranking officer in the Russian/Latvian army. (not ww1).. by trade he was a carpenter. Is there any way to access old war files with the name only?